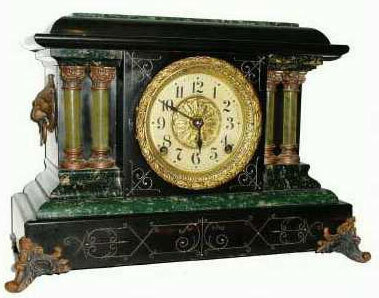 From 1860 through 1870 clocks imported from Europe with decorative slate, onyx or marble cases became very popular among the purchasers in the United States. 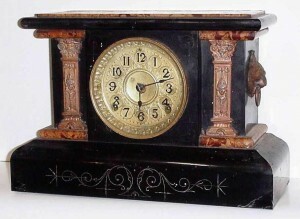 Clocks of this style became a status purchase among the wealthy. In 1882 Seth Thomas partnered with The Celluloid Manufacturing Company of New York City and started using a new material called Adamantine which was a celluloid veneer in a wide variety of colors that simulate marble or alabaster. This new material made the clock appear like many of the more expensive clocks imported from Europe, but would sell at a price most families could afford. Here are a few sample images of the Seth Thomas Adamantine clock made by Seth Thomas. Click the images to view the entire clock. 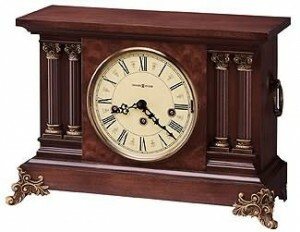 In 2004, Howard Miller Clocks introduced a new clock as a reproduction of this classic style called the Circa. The Circa is an all wood mantel clock made in USA with a German Movement. You may click the image to see the product detail and pricing for this new clock.Not everyone wants an antique clock and wishes for a new, more reliable timepiece. This antique-styled mantel clock features a lightly distressed finish and is rich in reproduction hardware, giving it a very authentic look. Decorative reeded columns frame the dial, and reproduction hardware adds a distinctive touch to the capitals, column bases, decorative rings, and front and rear feet. A Carpathian elm burl veneer creates an additional point of interest. Aged to match the era, the dial features Roman numeral graphics. Finished in Americana Cherry. German made Kieninger Key-wound Westminster chime movement requires winding only once per week. Chime on/off lever and durable bronze bushings.